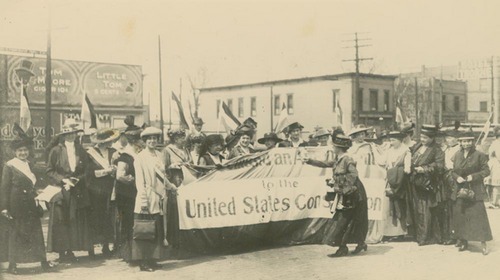 A photograph showing a group of delegates to the Kansas Equal Suffrage Association in Topeka, Shawnee County. This group voted to affiliate with the national association as support for a women's suffrage amendment to the U. S. Constitution. Kansas women had already won the right to vote in 1912.